Although typically suited to warmer regions, some species and hybrids can tolerate cooler climates. Where winter temperatures are particularly cold or frosts are usual, citrus can be grown in containers and moved into protective structures. Citrus are considered subtropical plants. Growth of citrus trees can occur within a temperature range of 13°C to 38°C. The ideal temperature for growth of oranges is between 21°C and 32°C. Ideal growth temperatures and also cold-hardiness vary among species and varieties. Trees can usually tolerate temperatures 1.6 to 2.2 degrees lower than those which would harm the fruit. Likewise, ripe fruit can tolerate lower temperatures than unripe fruit. Kumquats are the most cold-hardy species and can withstand temperatures as low as -8.8°C without losing leaves. Most mandarin trees can tolerate temperatures down to -5.5°C; dormant ‘Satsuma’ even -7.7°C. Oranges and grapefruit tolerate temperatures down to -5°C; lemons -3.3°C; limes -2.2°C. The choice of rootstock can also influence cold-hardiness, as rootstocks vary in their cold tolerance. Ripe navel orange fruit freezes at -2.7°C to -2.2°C, while half-ripe navel orange fruit already freezes at -2.2°C to -1.6°C. The duration of cold also determines whether fruit is injured. 3 or 4 hours exposure to temperatures of -2.7°C to -2.2°C damages navel oranges. Small lemons are already damaged after 30 to 60 minutes exposure to -1.6°C. Furthermore, citrus have heat requirements. To reach highest quality and sweetness, grapefruits require long, hot growing conditions. Other citrus have lower heat requirements, with lemons having the lowest. The temperature also affects the flowering time. Citrus trees flower earlier in hot climates than in cool climates. The fruit also ripens quicker when grown in a hot climate. Additionally, fruit size is affected by the temperature. Fruit grown in a hot area is typically larger than in a cool area. Citrus fruits are also juicier when grown in hot areas. Frost and cold conditions are detrimental to citrus trees so in colder temperate climates they are best grown in conservatories or greenhouses. But they can still be grown outdoors in colder climates provided that some precautions are observed. Grow against a brick wall or in a walled garden, sheltered from cooling winds. Grow within a hedge – but make sure that there is no root competition (citrus don’t like this). Grow in pots and move to a warm, sheltered position during colder months. Move pots to a greenhouse during winter. Mulch the roots to retain warmth. Avoid root disturbance once planted – citrus have shallow roots systems that are easily damaged. For those grown in protective structures, transplant into larger pots when they are at their most dormant in winter. Lemons and mandarins often do better in cooler climates than others. Grapefruit may grow in colder places, but they perform better in warmer climates. Some citrus such as limes are often difficult to grow in temperate climates but easier in the subtropics or tropics. Citrus trees require ample moisture for good growth and fruit production. Standing water however has a detrimental effect on their growth. Citrus trees are therefore best planted in a well-drained soil. Citrus trees require plenty of light for successful growing. Too much shade has a negative effect on their health and productivity. 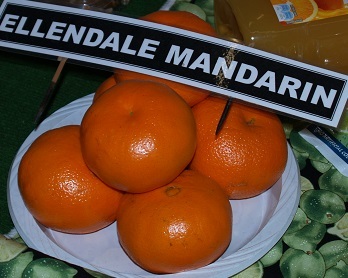 Fruit of citrus grown in the shade is usually smaller and lacks flavour. Furthermore, in cooler areas with higher rainfall, shade can promote the occurrence of fungal diseases, due to poor drying conditions. The growth pattern of different citrus species varies from erect to spreading. The choice of rootstock also impacts the size. Grapefruit, lemons and oranges can reach a height of 6 metres and a spread of around 6 metres under ideal conditions. Kumquats can be expected to grow up to 3 metres high and 2 metres wide. When selecting the planting site, the size of the tree should be kept in mind, to prevent damage to nearby structures and the tree itself. There should also be enough room around the tree to enable maintenance and harvesting when the tree is fully grown. The planting site should be selected carefully to avoid damage to the root system through earthworks that may be required on sewage or drainage easements or future building extensions. Several species of citrus are suitable for growing in large containers, e.g. the oval and round kumquats. The containers should have a capacity of at least 80 to 100 litres and must have sufficient drainage holes. Given that citrus are heavy feeders and many problems can arise from inadequate or excess amounts of particular nutrient elements, there are many purpose made citrus fertilisers available. These are often designed to be administered at particular times throughout the year. A typical balanced fertiliser for citrus will have high proportions of nitrogen and potassium, and a lesser amount of phosphorous. Nitrogen is often included in both slow and fast release (ammonium) forms. There are also trace elements like sulphur and calcium. Of the major elements nitrogen is often supplied through ammonium based fertilisers. Ammonium nitrate provides a fast acting solution because nitrogen is made readily available to plants roots. It is quickly taken up and move around the plant. However, it can also be quickly lost from the soil through irrigation or heavy rain and must be reapplied often. Ammonium sulphate takes longer to become leached out of the soil but it can make the soil more acidic, especially if used over several years. Urea is a cheap and less concentrated form of nitrogen. It needs to be watered in or dug into the soil. It is also available in soluble forms such as brand named liquid feeds. Potassium nitrate is also found in soluble fertilisers and provides both nitrogen and potassium. Phosphorous supplements are typically applied as superphosphate or ammonium phosphates. Superphosphate is found in many granular and powdered fertilisers. It also contains phosphorous, calcium and sulphur. Mono-ammonium phosphate is another potential source of phosphorous. It also contains nitrogen and is soluble and fast acting. Phosphorous is also present in poultry and animal manures, and if these have been used over many years the level may be too high. It's best to not apply phosphorous supplements in these cases or to just apply every other year thereafter. Potassium is typically supplemented through sulphate of potash (potassium sulphate) or muriate of potash (potassium chloride). Muriate of potash is less expensive and therefore more widely used but if there is an existing salinity problem it can exacerbate it, and it should not be used if the water is salty. Sulphate of potash also contains sulphur. It is often present in water soluble fertilisers. Like phosphorous, potassium levels can build up in the soil so soils should be monitored to see if it is necessary. Annual tissue analysis tests are often conducted on commercial crops to assess the relative proportions of all nutrient elements. Course - covers lots of fruit varieties - their care, pruning and general production needs. Course - Professional course for the farm manager grower,technician, or those working in allied trades. Article from College of Horticulture home study course, for landscaping ideas. Townhouses, Units, Terrace houses all have one thing in common – small garden areas.